I pray you had a safe return home, filled with inspiration and enthusiasm by all that was done “for the life of the world” at the Council. 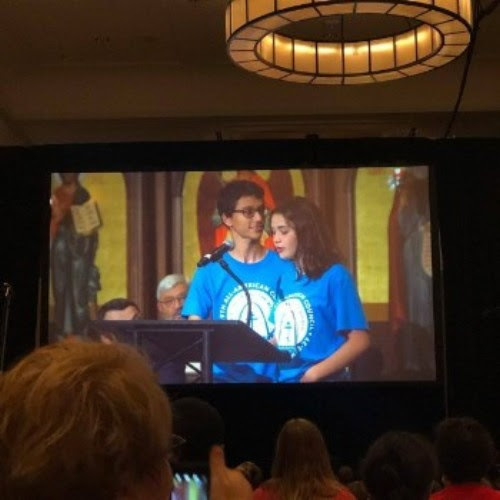 Those of you who have attended past Councils know that one of the week’s highlights is the youth presentation at the closing plenary session, and this year was no different. What indeed was different this year, however, was the amazing response to their presentation! After the words offered by His Grace, Bishop David of Sitka and Alaska and the generous pledge of $1,000.00 from Archpriest John Jillions, Chancellor –made with the blessing of His Beatitude, Metropolitan Tikhon — toward engaging a full-time OCA Youth Director, over 60 individuals followed his example and seized the microphones to make their own commitments on their own behalf and on behalf of their parishes to this most worthy — and clearly popular — “cause.” The result was that in a matter of ten minutes, $87,000.00 was raised! I invite you to watch the youth video, posted below, presented during the week which will not only inspire you as you see our future leaders “in action,” but equally encourage you to join those who already have pledged and contributed by making your own commitment toward making a full-time Youth Director for the OCA a reality! May we count on you to join those who contributed so generously to make a pledge/donation? And may we ask you to report this wonderful effort in your parishes, after tomorrow’s Divine Liturgy and coffee hour, and with your friends as well? Our youth are not merely the “future” of our Church; as seen by the impact their presentation made, they are clearly a most important element in the Church’s “present” as well, one with all of God’s People in proclaiming the Light and Life of the One Who gave of Himself “for the life of the world” and its salvation. Your donations/pledges may be made here via a direct donation to the Stewards of the OCA, which will be earmarked for this endeavour, or to make a pledge, or learn where to send a check please write to jmatusiak@oca.org.